Summer has been cool so tomatoes are ripening later than usual. We plant about 100 tomato plants so that we can process what we need in large batches. We share early and later harvests when there are fewer. This year we were running low on soup stock, tomato sauce and ketchup so tackled replenishing these. We use a Squeezo food processor to separate tomato pulp from seeds and skin. It takes a whole day each to pick a few bushels of tomatoes, manually grind them through the Squeezo, decant and preserve the "tomato plasma", add spices to the sauce and ketchup and can them, clean the equipment and feed what we don't use to the Guinea fowl. 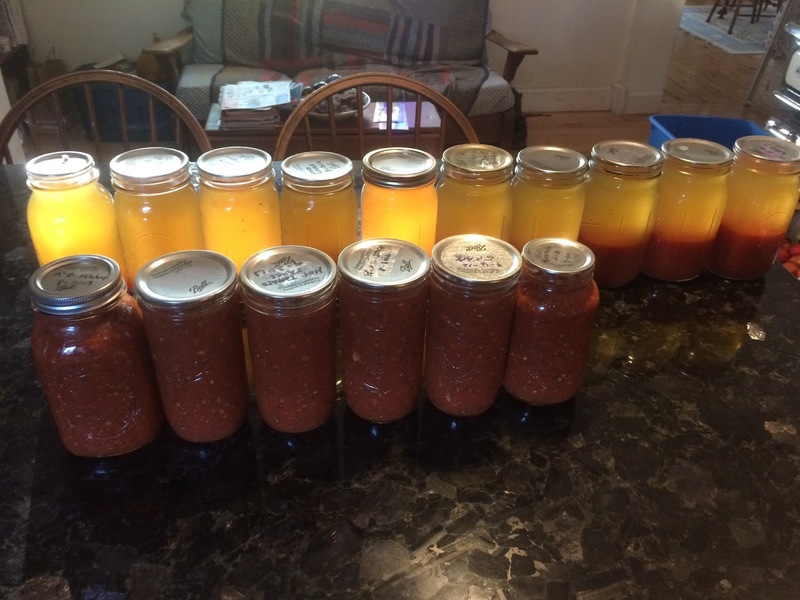 This year's totals: 22 quarts of tomato sauce, 31 pints of ketchup and 65 quarts of soup stock. It takes only half an hour to cook these because we separate the plasma from the pulp using a colander which we try to float in the sauce. To keep it from sinking, we bail out the clear liquid that leaks through the holes in the colander. This process does steal some of the garlic, onion and basil flavors from the sauce but delivers them in the soup stock. We make the ketchup after separating the plasma so that soup stock is pure tomato juice. We use a canning technique that uses a small amount of water in a pan covered by a jar support plate with holes. When the water boils, steam envelopes the jars and exits through two small holes in the lid. We steam these acidic products for 15 minutes once steam exits the lid. Canning Technique Where Water Boils under the Plate that Holds the Jars and the Cover Traps Steam to Envelop the Jars.